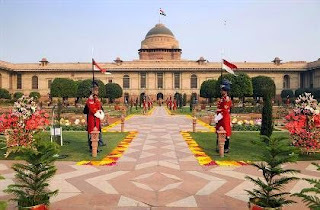 The Rashtrapati Bhavan organized a camp for residents and workers of the President’s Estate to facilitate them to apply for the Pradhan Mantri Jeevan Jyoti Bima Yojna (PMJJBY) and Pradhan Mantri Suraksha Bima Yojna (PMSBY). The camp was organized on 7th May, 2015 in association with the State Bank of India and United Bank of India. The two schemes PMJJBY and PMSBY have been launched by the Prime Minister of India today (9th May, 2015). Both the schemes will have one year insurance cover, renewable from year to year. PMJJBY and PMSBY provide a total coverage of Rs.2.00 lakhs. While PMJJBY will cover all the savings account holders of the age group 18-50 for death due to any cause, PMSBY will cover all the savings account holders of the age group 18 to 70 for accidental disability or death. The Premium for PMJJBY is Rs.330/- per year and for PBSBY is Rs.12/-. 1. I am happy to be amidst a group of academicians representing some of the best educational institutions in India and Russia. In the present-day knowledge societies, where innovation is at the core of growth, progress and prosperity, educational and research institutions play a critical role. Each of your institutions is a key participant in the national development of India and Russia. 2. Russia’s educational institutions have a great legacy of accomplishment. As far back as 1930, during his visit to the Soviet Union, Rabindranath Tagore had described your universities as “miracles in the realm of education”. It is this educational system that has led to Russia’s enviable success as a nation of learning. It has enabled Russia’s technological achievements in areas such as material sciences, aerospace, nuclear science, petrochemicals, mining and heavy engineering. 3. This hallowed institution where we stand now – the Moscow State University – has produced 17 Nobel Prize and Fields Medal laureates in the last sixty years. 4. India today seeks to accelerate her economic growth and development through a strong emphasis on technology and innovation. Our educational and research institutions are making vigorous efforts to rise to these ambitious national goals and the aspirations of our people. This includes a significant expansion in the reach of quality education, up-scaling our research capacities, and linking more closely research output to industrial needs. 5. Research is the cornerstone of academic endeavour. Its quality determines the academic calibre of an educational institution. Indeed, without strong research programmes, no institution of higher education can truly accomplish its central mandate of promoting learning and knowledge. It is, thus, imperative that all educational institutions place research at the core of their future plans and activities. 6. India and Russia have benefited from bilateral programmes of scientific cooperation. These include our Integrated Long Term Programme dating back to 1987, the establishment of joint centres of excellence as well as mutual research support programmes. In recent years, India and Russia have launched new cooperation programmes in areas such as basic sciences and health research. I am glad that our Department of Science & Technology and Russian Science Foundation have finalized a cooperation agreement which will offer another platform for supporting joint research projects. 7. India and Russia have a long history of educational cooperation. In the late 1950s, the Soviet Union supported the Indian Institute of Technology, Bombay in its formative years. Tens of thousands of Indian students studied in Russia in the 1970s, 80s and 90s. Though the numbers have dropped somewhat in recent years, even now, over four thousand Indian students study at Russian universities. Some of our institutions have active programmes of cooperation - exchange of students, researchers and faculty members, and sharing of research publications. 8. Notwithstanding this, there is a need for a broader and institutionalized engagement between our educational institutions. At the last Summit meeting between India and Russia in December 2014, the two countries had decided to support a network of partnerships between our universities. I am glad that over recent months, many of you have been involved with your counterparts in identifying opportunities for cooperation and are ready to formalize arrangements for systematic cooperation in the future. 9. The establishment of a Network of Indian and Russian Universities would facilitate establishment of more institutional linkages, including exchanges of faculty, researchers and students, joint research activities and scientific conferences and symposia. I extend my best wishes for fruitful cooperation in the Network. 1. It is my privilege to be here today at the Diplomatic Academy of the Russian Ministry of Foreign Affairs. At the outset, I extend my heartfelt gratitude to the Academy for honouring me by conferring an Honorary Doctorate. A matter of pride as it is for me, I see this as a manifestation of the enduring affection that the Russian people have for India. At the same time, it also reflects the depth and resilience of the relationship between our two countries, which I have experienced personally in my many decades of public life. 2. The Russian Diplomatic Academy was established in 1934. Since then, it has made a stellar contribution to Russian diplomacy in its role as the principal training institute for serving and aspiring Russian diplomats. This prestigious institution represents the finest ideals of humanity by training practitioners in the art of negotiations and preparing them to find diplomatic solutions to the challenges of peace and development. Active interactions with similar institutions in other countries have made this Academy an agent of diplomacy itself. 3. I am in Moscow for the Commemoration of the 70th Anniversary of Victory in the Great Patriotic War. The crucial role played by Russia and the sacrifices made by the Russian people during that historic period are well-known and widely recognized. I would like to convey warm felicitations to the Russian people on this historic occasion. Indians too made significant sacrifices during the War. In fact, our nations are united by our suffering and sacrifices in the fight against the forces of Fascism and Nazism. It is, thus, entirely appropriate that we today cherish and celebrate our shared victory. 4. Formal diplomatic ties between India and Russia have a relatively short history of 68 years. Even then, numerous threads have linked our peoples and civilizations over the centuries. Afanasy Nikitin journeyed from Tver, near Moscow, to India in 1469 almost three decades before the Portuguese Vasco da Gama reached Kozhikode. Nikitin lived for three years at Bidar in the Bahmani kingdom. His travelogue about his experiences in India, "Journey Beyond the Three Seas", is still read with interest in Russia and India. 5. As early as 1615 onwards, merchants from Gujarat reached Astrakhan at the mouth of the Volga River where a thriving Indian community flourished till the middle of the nineteenth century. They were extremely well regarded by the Tsar in Moscow, to whom they supplied fine textiles. It is said that the Indian traders introduced a textile industry in the Russian capital in the middle of the seventeenth century. 6. Our two countries also share a robust tradition of intellectual, literary and philosophical inquiry. The Indologist, Gerasim Lebedev, was a pioneer of Bengali theatre in Calcutta in the late eighteenth century. Leo Tolstoy was fascinated by Hindu and Buddhist scriptures. He was familiar with the thinking of Sri Ramakrishna and was impressed by the ideals of Swami Vivekananda. On the other hand, Mahatma Gandhi was deeply influenced by Tolstoy's thoughts about non-violent resistance and the renunciation of force as a means of opposition. The artist and philosopher, Nicholas Roerich, came to India in 1923. With his wife Elena, he founded the Urusvati Institute of Himalayan Studies in 1928. He lived near Kullu, Himachal Pradesh, till his death in 1947. 7. Rabindranath Tagore's poetry, which made a passionate plea for universal peace, love and harmony, was widely admired both in Tsarist and post-revolutionary Russia. Several Russian translations of Tagore's Gitanjali were brought out soon after its release in 1913. Tagore predicted that Russia would be victorious against the fascists, foreseeing the heroism of the Russian people. 8. It is noteworthy that India established diplomatic relations with the Soviet Union as early as April 13, 1947, over four months before India became independent. Since then, India and Russia have built a durable and multi-faceted partnership. The Bulganin-Khrushchev visit to India in November 1955 heralded a new era in bilateral ties. The steel plants at Bhilai, Bokaro and Durgapur became symbols of our friendship. The emergence of military-technical cooperation in the 1960s, and the Indo-Soviet Treaty of Peace, Friendship and Cooperation in August 1971, were major milestones in our relationship. The launch of India's first satellite Aryabhatta in 1975 by a Soviet launch vehicle and of the first Indian in space - Rakesh Sharma - in a Soviet spacecraft in 1984 underlined our close cooperation in space. 9. It was this powerful legacy of mutually-beneficial cooperation cutting across varied sectors that enabled our two nations to swiftly overcome the difficulties posed by wide-ranging changes of the early 1990s. It is no exaggeration to state that our unique and multi-dimensional ties have proved their resilience. India and Russia today enjoy what we have termed a 'special and privileged strategic partnership', based on unmatched mutual confidence, trust and goodwill. 10. Our Annual Summits are at the apex of an elaborate multi-layered mechanism for bilateral interaction, more detailed than India has with any country in the world. It has helped deepen and diversify our bilateral relationship over the past 15 years and evolve common approaches to major regional and international issues. 11. At the last India-Russia Annual Summit on 11 December 2014, our two countries agreed on a strategic vision to further strengthen and diversify cooperation in the years ahead. India values her close and extensive cooperation with Russia in defence, nuclear energy and security. Russia is and will remain our most important defence partner. It is also a key partner for our energy security, building on its leading role in the development of nuclear power generation in India. There are evident complementarities that underlie our cooperation in hydrocarbons. Russia is one of the world's largest oil and gas producers while India is one of the largest consumers. India's largest investment in Russia is in the oil and gas sector. This can increase significantly and emerge as the driver of a resurgent economic partnership. Both countries are committed to do so. 12. In this 40th anniversary of the launch of Aryabhatta, we have agreed to re-invigorate our cooperation in space. We have an extensive inter-governmental scientific collaboration programme. Joint centres of excellence have been set up to promote research in areas as diverse as powder metallurgy, vaccine development, super-computing, bio-technology, bio-medicine, gas hydrate studies, and earthquake research, to name a few. We are also looking at intensifying cooperation in innovation-driven projects in high technology areas. 13. During President Putin's visit to India in December 2014, we jointly agreed to the need to move our trade and economic ties to a higher level. We must build on synergies in areas such as engineering, pharmaceuticals, chemicals, fertilizers, coal, diamonds, metallurgy, civil aircraft, automobiles, and information and communication technology. Concerted and joint efforts will be needed to overcome structural and other impediments to India-Russia trade and economic collaboration. Indian businesses need to reach out to Russia's regions and be more responsive to business opportunities in Russia. Russian companies need to do the same. We need to comprehend each other's achievements and capabilities, and recognize the huge opportunities for investment and technological tie-ups in our dynamic markets. 14. Cultural and people-to-people ties bind us closely. We appreciate the warmth and openness with which Indian culture, philosophy and cinema are received in Russia. The exchanges between our Universities, institutes of higher learning, scholars, artists and intellectuals are of the highest significance and must be encouraged. A Festival of Russian Culture was celebrated in India last year. The Year of Indian Culture "Namaste Russia" is being celebrated in Russia this year. Tourism between India and Russia has grown significantly in recent years and can develop further. 15. The world of today is equally one of unprecedented opportunities and grave challenges. Even as living standards and technological capabilities improve with each passing day, we are also witness to a re-emergence of conflict and serious economic and ecological crises in different parts of the world. Terrorism and extremism emanating from our shared neighbourhood remains a major security threat for India and Russia. Dealing with this challenge requires not only a strong commitment by our two countries but also cooperation among the international community. 16. Indeed, the international community requires cooperative and representative structures more than ever before. Though the world has become increasingly multi-polar and emerging economies have grown in strength, this is not fully reflected in international institutions and decision-making processes. Cooperation between India and Russia in multilateral fora, including G20 and BRICS is thus of great importance. We congratulate Russia on its Presidency of two important fora - BRICS and Shanghai Cooperation Organization - this year. We will work closely with our Russian friends to enhance multi-sectoral cooperation within these fora. We appreciate Russia's support for India's permanent membership of UN Security Council and membership of the multi-lateral export control regimes. We applaud Russia's efforts to promote a political settlement in Syria and its contribution towards a peaceful resolution of the Iranian nuclear issue. 17. India-Russia relations, shaped as they are by our respective historical experiences, cultural affinities, political convergences and economic opportunities, will not be affected by winds of transient global political trends. Russia has been a pillar of strength at difficult moments in India's history. You have contributed to India’s development, growth and security. India will always reciprocate this support. Across Indian society and the spectrum of its political structures, there is unanimity that friendship with Russia is an important pillar of India's foreign policy. 18. Let me also take this opportunity to emphasize that the dynamic development of our strategic partnership owes a great deal to the vision and leadership of President Vladimir Putin. His personal commitment has led us to new heights in our relations. We recognize President Putin as a great friend of India. I look forward to renewing my association with him on this visit. 19. Once again, I thank you and the members of this great institution for the honour you have bestowed on me today. I also wish to thank you for this unique opportunity to share my thoughts with you. The President of India, Shri Pranab Mukherjee visited Moscow State University yesterday (May 8, 2015) and witnessed the launch of a Network of Indian and Russian Institutions of higher education. An agreement between the Ministry of Science & Technology, Govt. of India and Russian Science Foundation as well as several agreements between Indian and Russian university were also signed on the occasion. Speaking at the event, the President said India and Russia have a long history of educational cooperation. In the late 1950s, the Soviet Union supported the Indian Institute of Technology, Bombay in its formative years. Tens of thousands of Indian students studied in Russia in the 1970s, 80s and 90s. Though the numbers have dropped somewhat in recent years, even now, over four thousand Indian students study at Russian universities. Some of our institutions have active programmes of cooperation - exchange of students, researchers and faculty members, and sharing of research publications. The President said Russia’s educational institutions have a great legacy of accomplishment. As far back as 1930, during his visit to the Soviet Union, Rabindranath Tagore had described Russian universities as “miracles in the realm of education”. It is this educational system that has led to Russia’s enviable success as a nation of learning. It has enabled Russia’s technological achievements in areas such as material sciences, aerospace, nuclear science, petrochemicals, mining and heavy engineering. The President said there is a need for a broader and institutionalized engagement between educational institutions of India and Russia. At the last Summit meeting between India and Russia in December 2014, the two countries had decided to support a network of partnerships between their universities. Many of universities have been involved with their counterparts in identifying opportunities for cooperation and are ready to formalize arrangements for systematic cooperation in the future. The establishment of a Network of Indian and Russian Universities would facilitate establishment of more institutional linkages, including exchanges of faculty, researchers and students, joint research activities and scientific conferences and symposia. The Prime Minister, Shri Narendra Modi, today invoked the poetry of Gurudev Rabindranath Tagore to state that the poor do not need support (sahaara), but strength (shakti). He was speaking at the launch of three social security schemes: Pradhan Mantri Suraksha Bima Yojana, Pradhan Mantri Jeevan Jyoti Bima Yojana, and Atal Pension Yojana, in Kolkata today. The schemes were launched in simultaneous functions at 115 venues across the country. Give me the capacity to bear my burden," the Prime Minister said, quoting from Gurudev Rabindranath Tagore. The Prime Minister said Kolkata had been chosen for the launch of these schemes because, to quote Shri Gopal Krishna Gokhale, "what Bengal thinks today, India thinks tomorrow." The Prime Minister said that it was indeed a matter of great pain that 80 to 90 percent of the people in India do not have access to insurance and pension. He said that the fruits of development must reach the poorest of the poor, and therefore, the Union Government had launched the Pradhan Mantri Jan Dhan Yojana under which 15 lakh accounts had been opened. Now, he added, Jan Dhan was being taken a step forward to Jan Suraksha with the launch of these social security schemes. He said Jan Dhan Yojana helped bank the unbanked, Mudra Bank would help fund the unfunded, and these schemes would help secure the unsecured. He said the schemes had been launched on trial basis since May 1st, 2015, and 5 crore, 5 lakh people had enrolled for them so far. The Governor of West Bengal Shri Keshrinath Tripathi, The Chief Minister of West Bengal Ms. Mamata Banerjee, and Union Ministers Shri Jayant Sinha and Shri Babul Supriyo were present on the occasion. The Prime Minister, Shri Narendra Modi, today made an emotional appeal to left-wing extremists to shun the path of violence and join the mainstream of development. Addressing a large public gathering at Dantewada, the Prime Minister urged all misguided youth to leave their weapons, and spend a few days with children who have lost their parents due to incidents of left-wing extremism. He said those children would certainly inspire misguided youth to lay down arms forever. He said shoulders of youth should now bear ploughs, rather than guns. Chief Minister of Chhattisgarh Shri Raman Singh, and Union Ministers Shri Narendra Singh Tomar and Shri Vishnudeo Sai were present on the occasion. 1) MoU between Govt of Chhattisgarh, NMDC, IRCON and SAIL for 140km rail line between Rowghat and Jagdalpur. Estimated project cost: Rs. 2000 crore. 2) MoU between Ministry of Steel, Govt of Chhattisgarh, SAIL and NMDC for 3 million ton Ultra Mega Steel Plant with an investment of approximately Rs. 18,000 crore. 3) MoU between Govt of Chhattisgarh and NMDC for Slurry Pipeline and 2MTPA Pellet Plant at Nagarnar in Bastar District with an investment of Rs. 4000 crore. 4) MoU between Govt of Chhattisgarh and SAIL for setting up 1MTPA Pellet Plant at Dalli-Rajhara, Balod District with an investment of Rs. 826 crore. The Prime Minister, Shri Narendra Modi, today called for the development of the innate sporting talent that exists among the tribal youth. Interacting with students at the Education City in Jawanga in Dantewada district of Chhattisgarh, he said tribal youth could excel in the global sports arena. He added that sports is important for children, because it leads to the development of sportsman spirit in society. Responding to questions from students, the Prime Minister said life should not be measured on a scale of success or failure. Talking about his own experiences, he said he has faced failure often in life. However he added that one can learn more from failure, than from success. He said one should be clear about one's goals, and have a firm resolve, in order to achieve success. The Prime Minister also visited 'Saksham' - a school for specially-abled children - and interacted with students there. The Chief Minister of Chhattisgarh, Dr. Raman Singh, was present on the occasion. The Prime Minister, Shri Narendra Modi has paid tributes to Shri Gopal Krishna Gokhale, on his birth anniversary. "Gopal Krishna Gokhale was a great personality; a remarkable freedom fighter and social reformer. Tributes to him on his birth anniversary", the Prime Minister said.